Selah DECA Students Pack their Bags for State! Eighteen Selah High School students are packing their bags as they are headed to the State DECA competition. 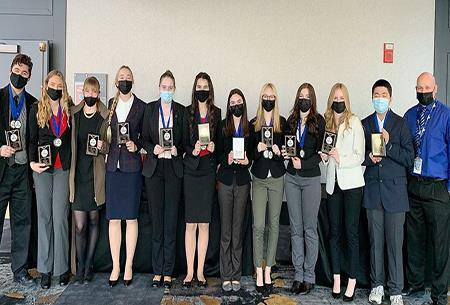 Following participation at the Area DECA competition held in January, Selah students were among the top contestants in the contest’s field and earned the opportunity to compete at the state event in February. In all, 25 Selah High School students competed in the Area qualifying event against 16 local high schools including Wenatchee, West Valley, Ike, Davis, Ellensburg and Sunnyside. Earning first place honors in their respective contest events and qualifying for State competition were Alexis Kearby and Hannah Weeks (Hospitality Services), Johanna Badillo (Hotel and Lodging), Samantha Hudson (Quick Serve Restaurant), and Scott Willey (Retail Merchandising). Placing second in their contest events and also qualifying for the state event were: Kyrsten Callahan and Kylie Topper (Buying and Merchandising), Cecilia Campos-Sosa (Financial Consulting), Azzy Church (Food Marketing), Adrian Escamilla and Josh Ibach (Marketing Management), Alexsandra Vargas (Restaurant and Food Service), and Nick Garretson (Sports and Entertainment). Finishing with third place recognition to advance to the state contest were Adam Escamilla and Cooper Vick (Business Law), Ian Dibble (Marketing Communications) and Kristine Binay and Breanna Naranjo (Travel and Tourism). By creating partnerships between business and education, DECA provides hands-on and real world experiences, which prepare future leaders and entrepreneurs for careers in marketing, finance, hospitality and management opportunities. Congratulations Selah High School DECA students! Good luck at State!